Heart connections are forever. Yesterday I meet Gaia after 4 years. She was stolen from our center in 2012. When I saw her I called her, she called me. It was very beautiful and touching. Even though she lost some body weight she had not lost her beautiful mind and spirit. I will soon share the story of Gaia and you can follow the journey how she returns to us again. I have been very fortunate lately, because a new horse joined us and I get to observe the integration of a new member to the herd I rescued three years ago. My herd has six members and they know each other, their places and responsibilities very well. One month ago a young two year old mare, ran away from her home in the village over to our center. She ran away as her mother had got a new foal and the owner had parked her in another location alone. She did not like that so she would of course try to run away. She had as a young foal passed our center with her mother as the farmer rode to his mountain farm. So she knew the way to our herd and came running over. She would make alot of fuss outside the fence and my herd would make alot of fuss on the inside. We would take her torn rope, ad some more and tie her to the mango tree until the owner came. The next day she was however back again making a fuss to get friends at the fence. So we figured if we do not integrate her with the herd we would have to fix alot of fences. Next time she came, we decided she should stay with us, even if I really did not have any plans to increase the number of horses. We placed her in a smaller area where the little lady could learn to respect the fence all by herself. She could now take look at all the herd members from a distance, make fuss as much as she wanted, shake her short mane in the wind and show off a bit of trotting with high knees and her tale out. The herd could look at her, walk by, discuss and start talking to her from a distance. By now we had named her Gaia (which means mother earth in Greek) and Gaia had learned to respect the fence. After 3 more days we decided to let the lead mare in together with her. Meanwhile I had found Gaias owner in the village and agreed with him that she could just stay as she would run back to us anyway. The farmer agreed with the suggestion as he had enough with Gaias mother and the new foal for the time. The farmer had tried to lend out Gaia to his friend. It did not work because his friend did not know horses and had also become afraid of the little smart strong minded lady. Our lead mare is a very good teacher and started to teach Gaia right away when they were together. She taught her many lessons. 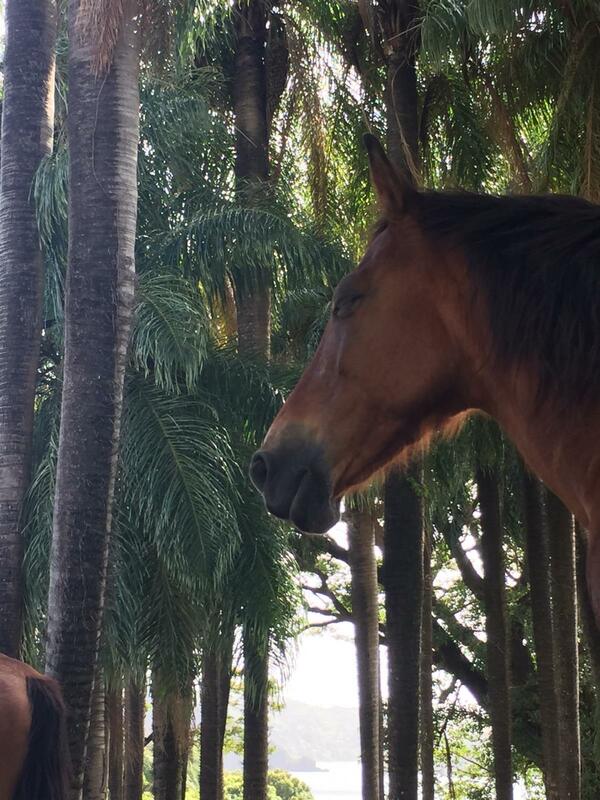 Our lead mare is strict, loving, proud, intelligent and very fair. After 5-6 days together Gaia had learned some new manners and accepted to be trained by the lead mare. Her reward was to be able to stand closer. The lead mare taught Gaia by leading her from behind, sharing and taking territory and she taught Gaia to pay attention and respect, especially around food and space. After the first lessons and Gaia had accepted that she was the student we decided to introduce her together with the lead mare to more of the herd members. 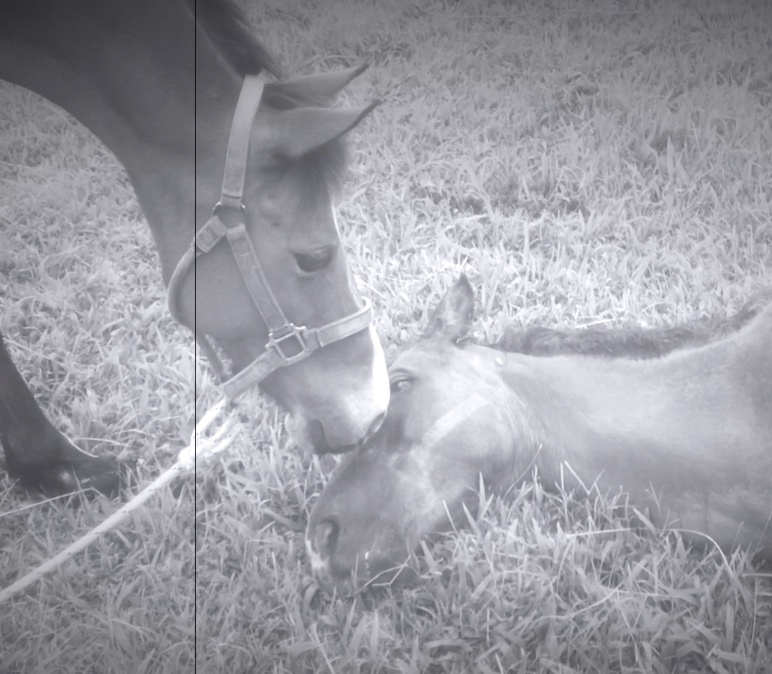 The lead mare would continue to teach Gaia manners while one and one of the new members were introduced and taught to give a fair introduction. She would protect Gaia from the others in the herd if there was any rudeness coming around. Now one month later Gaia can stand close with the whole herd and the integration is almost complete. Gaia only knew her mother so she needed to learn alot about working in a group, accept learning, space and learn to apply for membership in the herd. Making fuss and trying to impress outside the fence was not the way to be accepted in the herd. We will now give Gaia some more time to fully integrate and develop the friend ship with the youngest mare of two years before we start with the waterhole rituals to connect with her. We are learning new things from her as she asks us different questions we have to find the answers to and she also ask about things that are obvious for us but not at all for her. Introducing the two year young Gaia to the herd in 2010.